U-M’s BioArtography program shares the beauty and impact of basic science. That is exactly what Gumucio had in mind when she created U-M’s BioArtography program more than a decade ago. BioArtography comes from U-M’s basic science labs, where researchers add stains to microscopic tissues to observe their structures under the microscope. Researchers are encouraged to photograph results they find particularly eye-catching or scientifically interesting and submit the images to Gumucio. She collects the images and presents them to a jury of arts professionals each spring. That jury selects 15 images to be printed on notecards, enlarged and framed, or transferred directly onto canvases and featured at the BioArtography booth during the annual art fair. Proceeds from sales at the fair, or online at the BioArtography website, allow students and postdoctoral fellows who are training in U-M labs to attend scientific conferences. BioArtography images have been displayed prominently around the U-M at the North Campus Research Center and in Museum of Natural History exhibits. They have also exhibited in art galleries, libraries and art shows across the state. Fiber Artists @ Loose Ends, a Washington D.C. organization that brings healing art quilts to hospitals and other venues, has used BioArtography images in their projects as well. But Gumucio says she is most proud of the artwork’s ability to create interest and enhance public knowledge around many aspects of biology, and to help people better understand things like stem cell research, for example. The Ann Arbor Street Art Fair will take place from July 21-24, and the BioArtography booth (booth 112) will be located on East University Avenue. 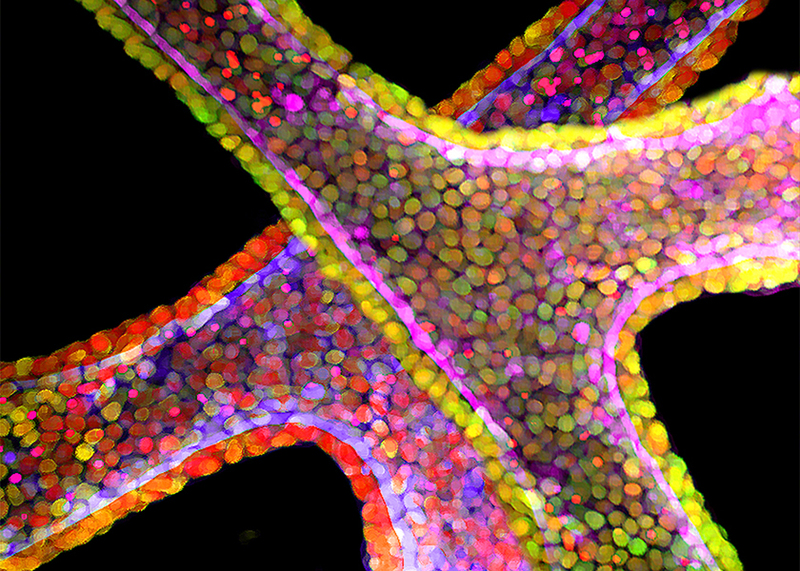 View a gallery of the selected BioArtography images here.